Slack. The ubiquitous app for office workers around the world, Slack makes it easy to create channels to collaborate with your team, with Channels to have separate conversations about certain projects with certain team members and the ability to add files or conduct voice or video calls. Slack is free for small teams, and has paid options for larger teams with features like group voice calls, unlimited message and file search, and expanded storage. Slack has easy file sharing options. Google Hangouts. 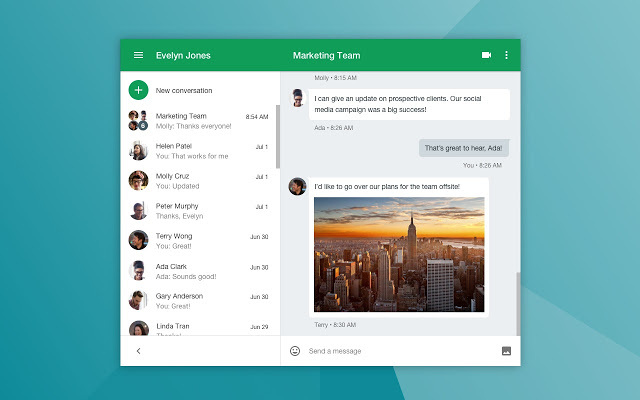 The successor to Google’s Google Talk (also known as Gchat), Google Hangouts is a SMS, video, and VOIP messaging service that works for anyone who has a Google account. It is lightweight and has a number of services aimed at project management that integrate with it, like Wrike. Google Hangouts is free to use. Google also offers a business-oriented “Hangouts Chat” version with its low-cost G Suite plans, which come with 30GB+ of cloud storage and business email. ﻿WhatsApp. A wildly popular mobile-based messaging service, WhatsApp also has a web app, a desktop-based app for PC users via the Microsoft Store, and a new “WhatsApp Business” app in the Google Play Store .If your team already uses WhatsApp on mobile and primarily communicates about your show via text, images, or short voice memo clips, then Whatsapp is an easy, lightweight, and familiar option for creators. All of WhatsApp’s versions are free to use. WhatsApp’s file sharing function is easy to use and useful for sharing audio clips or document/spreadsheet files. Google Drive. Whether it’s Sheets for all of your spreadsheet needs (and we’re a big fan of spreadsheets), Docs for more longform writing like script writing, or simply sharing podcast assets in Drive’s shared folders, Google Drive is an easy, free way to collaborate with your podcast team. In fact, we at Backyard Media use Google Drive when creating our own podcast, Backyard Cambridge. Doc’s comment system is an easy way to collaborate on editing scripts, while Sheets provides a robust suite of tools for budgeting, managing interview logistics, and more (we talked about all the things creators can use Sheets for in our guide “How Solid Organization can Make the Difference in your Podcast Production” - check it out). Google Drive is free to use up to 15 GB of file storage, and you can buy more storage with Google One or by getting a paid G-Suite option with lots of other business features. Google Drive’s folder sharing is intuitive and makes it easy to add/remove people. AirTable. A service that bills itself as part-spreadsheet, part-database, AirTable allows users to expand upon the traditional Excel/Google Sheet by adding attachments, images, rich text fields like drop-down menus and longer notes, as well as embedded links to other “Tables”. They also offer calendars, kanban-type workflows, and a number of other designs to match how your team wants to manage its production cycle. AirTable is great for podcast creators who want an integrated solution for production calendars, budget spreadsheets, and episode development spreadsheets. Free to use with limited features, and $10 or $20 per user per month for more features or for bigger teams. AirTable’s spreadsheet design involves a lot more than text in cells. Trello. This “kanban” project management system allows users to create ‘boards’ for different projects and tasks, assign them to team members, attach files to them, make checklists, and set deadlines. It’s a great option for podcasts, as creators can move episodes from list to list as they flow through their production cycle, from conception to production to distribution. Free to use, with $10 or $20 paid options for more integrations and increased file attachment limits. An individual card detail on a Trello board. Asana. A popular project management tool in the business world, Asana allows users to assign tasks to team members, outline a clear production cycle, provide detail to project steps, and attach and share files seamlessly. We particularly like its “timeline tool” for podcast teams starting a podcast that involves multiple people or a complex, seasonal production schedule. Asana is a paid tool, with $9.99 per user/month Premium and $19.99 per user/month Business options. Detail screens provide context for who’s responsible for which task, with sub-deadlines and note fields. Asana's Timeline tool can show what everyone needs to work on up until launch day. Squarespace. Every podcast has heard about Squarespace. The website maker is all over podcast ads, and markets itself as a platform that makes it easy for creatives to choose a template they like and customize it for their podcast using an innovative “Block” system. We at Backyard Media use Squarespace for our business, and it allows for great customization and options to feature our content. Podcast creators can also host their audio files on their website with Squarespace (see the company’s podcasting overview here), or they can build a site for listeners to visit and listen to clips of the show, see the team, and get in touch. Squarespace offers a number of plans, including a $16/month plan for personal websites (reduced to $12/month if paid annually), sufficient for most podcasts. A custom-built podcast website on the Squarespace platform. WordPress. The ubiquitous website builder that powers millions of sites across the Internet. WordPress offers creators plenty of flexibility to mix and match themes and third-party plugins to make the platform work how they want. Creators can even post podcasts directly through WordPress using the PowerPress plugin made specifically for podcasters. Wordpress.com costs $4 or $8/month, depending on the feature set you want. The company also offers Wordpress.org, a free platform that allows creators to self-host using a server or other hosting service and have more control of their site. A podcast website made on WordPress with the “Podcaster” theme. Wix. Wix is another website builder that powers many sites for creatives. It also boasts a three-tier site-building experience, depending on how much code you do or don’t want to deal with: Wix ADI (AI-driven, pre-built site), Wix Editor (customize a site template), and Wix Code (build a site with coding). Much like Squarespace, Wix offers a number of templates for user to choose from. It also has the Wix App Market to supercharge your site with different third-party apps for things like adding embeddable podcast players, conducting listener surveys, and more. Wix has an ad-supported free plan, but offers more feature-rich paid plans for a $11/month plan and $14/month. A podcast using the Wix platform for their site. Check out our step-by-step guide on how to set up your podcast host. Anchor. If you don’t want a full website for your podcast and simply want to publish and get your show onto directories like Apple Podcasts and Stitcher, you might want to consider Anchor. The platform aims to make podcasting as simple as possible, even allowing users to record and upload to the site immediately using the Anchor app. For more involved podcasts, you can upload your finished audio and create your RSS feed and submit it to the various podcast directories. Anchor is free to use. Publishing audio to your RSS feed is as simple as creating and episode and publishing immediately or at a later date. LibSyn. Arguably the largest podcast audio hosting platform in the world, LibSyn has a suite of tools for starting your RSS feed, managing podcast episode uploads, scheduling episodes and distributing your podcast to the main directories. Libsyn is a paid tool and costs between $5-$75/month depending on your amount of audio storage. The $15/month plan is usually recommended for beginning podcasters. Libsyn’s dashboard, including episode download statistics. Blubrry. The other main podcast hosting platform after LibSyn, Blubrry offers straightfoward media hosting and statistics for its users. It’s also very easily integrated with WordPress through the free PowerPress plugin. Distributing your podcast is as simple as uploading your audio to Blubrry, and then directing WordPress to publish that audio through a blog post. Blubrry’s pricing starts at $12/month for smaller shows (listening statistics included), with a $20/month option for podcasts posting multiple times a month. Blubrry’s main dashboard and episode management interface. Simplecast. A newer hosting option that aims to make podcast hosting as "simple” as possible, Simplecast lives up to its name with a clean dashboard and straightforward setup. Backyard Media works with a number of podcasts that use Simplecast, so it appears to be gaining market share after years of LibSyn/Blubrry dominance. Simplecast offers a single plan with unlimited audio storage at $12/month, with an option for a 14-day free trial. Simplecast’s dashboard interface is clean and straightforward. Audacity. A free, basic audio editor that many creators use when starting out their podcasts. Audacity is open-source and easy to record podcast audio in, as well as edit and export final mixes. Note that Audacity uses destructive editing, meaning it will change your audio file as you edit it, which most editors do not do. Hindenburg Journalist ($95). Hindenburg Journalist is a great editor for those who just want to get their story done without lots of plugins or other music-related features. It makes editing, mixing, and exporting your podcast straightforward. Hindenburg Journalist is the basic option at $95, with the more powerful Pro version available for $375. Hindenburg allows users to try out their software for free for 30 days using a trial key. REAPER ($60). REAPER is a popular audio editor created by Cockos. It’s low cost, with a constantly updated feature set and active online user base. REAPER also comes with a generous 60-day trial for those who want to try it out with their podcast. A personal license costs $60 (useful for small podcasts) while a commercial license costs $225 (for podcasters making more than $20,000 per year). Pro Tools First. Pro Tools is the most ubiquitous Digital Audio Workstation (DAW) in existence, and is the editor of choice for many radio stations. With that legacy, it’s a great audio editing option, especially for creators looking to learn a DAW for the long term. Pro Tools First is free with limited storage options. Pro Tools Standard is $25/month or $299 for a year’s subscription. Adobe Audition ($21/month). Part of the Adobe Creative Cloud suite of products, Audition is another common DAW that offers straightforward editing for whatever your podcast needs. Adobe sells a monthly one-app subscription for $21/month. Auphonic. Auphonic is free Loudness normalization and leveler tool. This helps your finished podcast audio have normalized volume, so that different audio clips don’t have different volumes, an essential tool for any podcast. 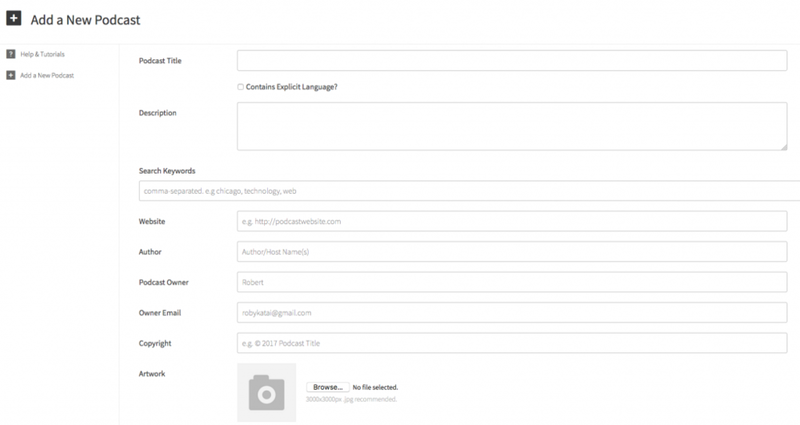 Simply sign up for an account, upload your audio and Auphonic will process it. The service can also remove hum and other noises from your audio and insert chapter markers and other file tags. Auphonic is free for the first two hours of audio processed per 30 days, with inexpensive options to buy more audio processing time after that. Free processing time refills every month. iZotope RX 7 Elements ($129). RX 7 Elements is a suite of four plugin tools to help clean your audio of mouth sounds, background sounds like hums, and other less-than-ideal sounds that can distract your listener. It offers a standalone editing program and can also integrate with your DAW as a plugin. RX 7 Elements costs $129 and users can try it out for two weeks free. There are occasionally sales where Elements drops to under $100. RX 7 Standard offers more podcast-relevant cleaning tools and is usually $399. Blue Dot Sessions. An excellent, minimalist music studio focused on creating tracks for podcasts and other creative projects, Blue Dot Sessions has an intuitive browsing interface where you can filter tracks by feel, instrument, and album. Blue Dot Sessions offers free licenses (with attribution) to non-commercial podcasts, and blanket licenses starting at $25 for commercial shows. Podington Bear / Sound of Picture. Podington Bear offers dozens of albums of thematic and genre-based music for creatives. Free for non-commercial podcasts (with attribution), with licenses cost as low as $5 depending on show budget and frequency of use, and blanket licenses for $250. FreeSound. A community-based music site with everything from full songs to MP3s featuring blips and beeps. Individual creators set their license requirements, though most are Creative Commons with some requirement for attribution. Incompetech. A common music repository used for YouTube videos, run by Kevin MacLeod. It has thousands of tracks covering all kinds of genres. Tracks are free (vocal attribution for podcasts required), or paid licenses for those not wanting to provide attribution. FPE SoundVision. A music studio that offers tracks spanning dozens of genres and styles, including tracks with vocals. Licenses for single tracks start at $50. Sounds Like an Earful. An independent site with a variety of music tracks, many of them aimed at podcasts. Licenses for each track are priced at three tiers: Indie (non-commercial podcasts), Digital (for-profit, non-broadcast media projects), and Broadcast (for use in traditional media). It also has a section with free tracks. All licenses require attribution to the site. Signal Sounds. A musician brother duo in New York with a growing library of tracks. Licensing is a bit ad-hoc, they ask that users contact them with information about their show to figure out license cost. TweetDeck. Twitter’s native platform for managing multiple accounts, track hashtags, and see mentions of your handle. Great for creators who want to manage and post from both their own Twitter accounts and schedule tweets for their show. Free to use. HootSuite. A social media management platform for Facebook, Twitter, YouTube, Instagram, and more. Allows for scheduling, analytics, monitoring of hashtags, and more. The free version of Hootsuite allows for a limited number of profiles/messages but is sufficient for most podcasters. Paid plans for more features. Buffer. A platform for managing social media across multiple channels in a single dashboard, with advanced scheduling features. Buffer has a free version for 3 accounts/10 posts per account, with a $15/month Pro plan. Podcasters should start with the Free plan. Moz. A site with helpful SEO tools for driving traffic to your website. We particularly like the Keyword Explorer, which allows you to research possible keywords you can use in your content to drive searches to your podcast. Google Analytics. Analyze web traffic to your podcast’s website. Know where, when and how they’re getting there. Free to use with a Google account. MailChimp. One of the most popular newsletter providers and integrates with e-commerce stores well (useful if you start producing merch for your podcast). A great free option with a $10/month option for over 2,000 subscribers.